The date field allows you to select a date via a friendly UI. 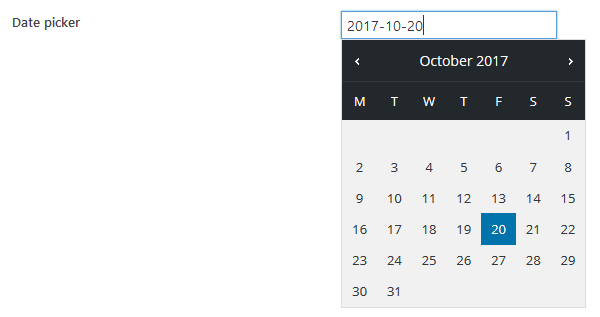 This field uses jQuery UI datepicker library to select a date. size size of the input box. Optional. Default 10.
inline Whether to display the date picker inline with the edit, e.g. do not require to click the input field to trigger the date picker? true or false (default). timestamp Whether to save the date in the Unix timestamp format (but still display in human-readable format)? true or false (default). js_options Date picker options. See here. save_format Custom PHP format for the datetime saved in the custom fields. See PHP’s function date() for the list of formats. // Save value as timestamp? If the timestamp is set to true, the field value is converted to Unix timestamp and saved to the database. Otherwise, the user input value is saved. Meta Box already supports customizing the date format displaying to users via js_options. In some cases, you might want to display in one format and save in another format. It’s now possible in Meta Box 4.16. So when displaying to users, the date will have the format of 30-01-2019 and when saving to the database, it will have the format of 2019-01-30. This is extremely useful when you want to sort or query the posts based on date value. Also please note that this feature requires PHP 5.3+. The 2nd parameter of rwmb_the_value() accepts and extra parameter format which specify the datetime format to output in the frontend. However, you still can sort posts by meta value if you set date format to something similar to yy-mm-dd. Anyway, querying posts by custom fields is not recommended.